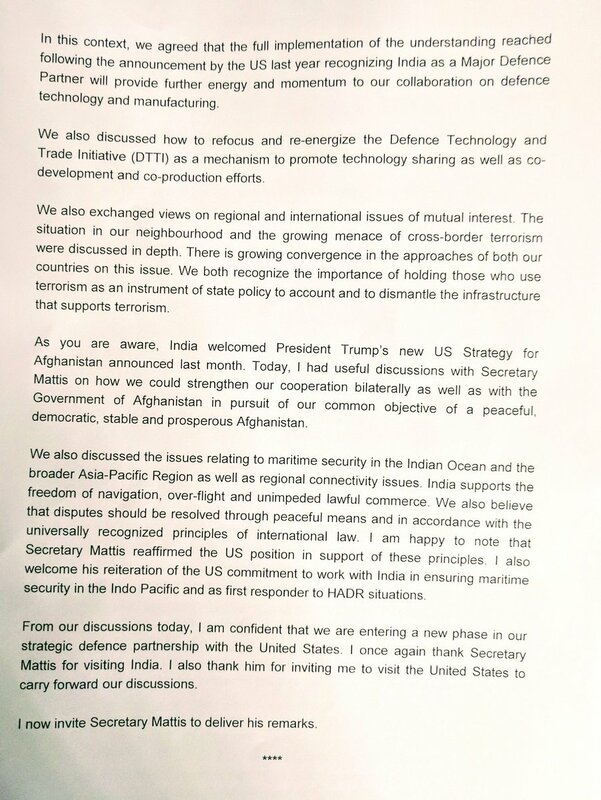 Discussion in 'Defence Analysis' started by BlackOpsIndia, Sep 26, 2017. 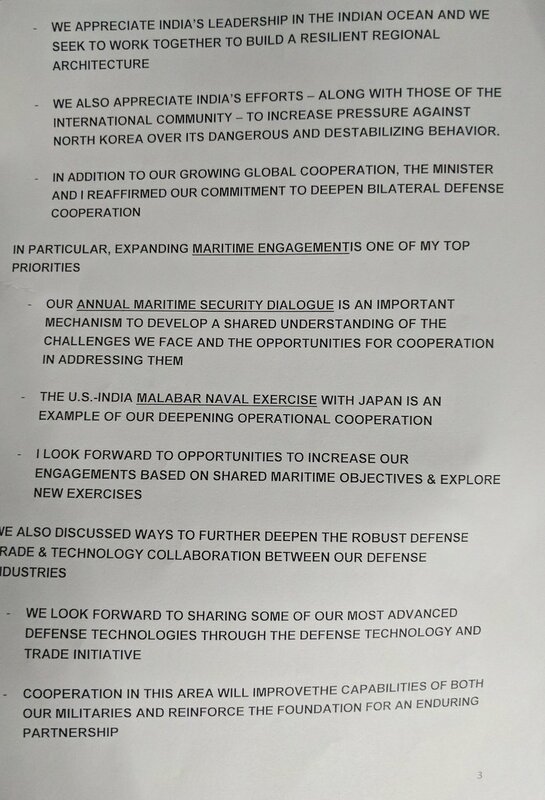 Mattis has arrived in India but strange to see no thread on this topic except from bot. @PARIKRAMA @Hellfire sir please your source based news on this thread. 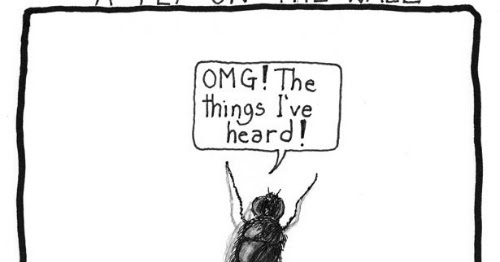 Nothing formal just what you are hearing about what Mattis is asking and offering. There was a worrisome article from Bharat Karnad about US asking India to give up our options against Pakistan from Afghanistan. How much of it is true and do we even acknowledge any such thing forget giving it up? Any other member please feel free to join and post whatever info you have. GuardianRED, PARIKRAMA, Wolfpack and 1 other person like this. drones and f-16 are the big items on the ticket. PARIKRAMA, Blackjay and BlackOpsIndia like this. PARIKRAMA, Wolfpack, BlackOpsIndia and 1 other person like this. Karnad's claims about the link between TTP and India were interesting. I have never heard any other Indian expert make the sort of claims in this regard that he does, and he seems quite insistent about it too. Wonder how much there is to that. And frankly, if nobody till date could force Pakistan to end its support to anti-Indian terror groups, I have serious doubts about anyone being able to force India to sever any ties it may have with TTP. GuardianRED, Schwifty, PARIKRAMA and 3 others like this. GuardianRED, Schwifty, PARIKRAMA and 4 others like this. 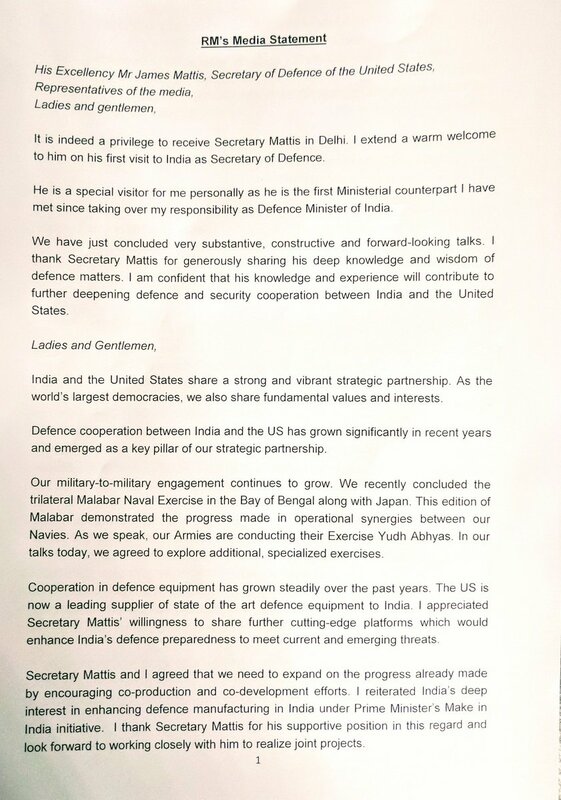 Defence Minister, Nirmala Sitharaman has spoken. India will give all support to Afghanistan,but will not put boots on ground. BlackOpsIndia, Blackjay, PARIKRAMA and 2 others like this. He is just another Anti-Modi conspiracy theorist parroting ISPR ,ISI and Pakistani propaganda of RAW links with TTP. Whether he does it out of hatred for RSS.BJP or due to cash remains to be seen.There are plenty of ISI moles in India,who would love Congress to be in power,so that Pakistan and China can carry its business as usual. PARIKRAMA and Scotlander like this. BlackOpsIndia, Wolfpack and PARIKRAMA like this. Hmm. Lost chance. They should have atleast committed some men. If we want to be taken seriously around the world, we need to be seen around the world. Right now, we are on the train traveling, street shitting, starving brown people. This was a good chance. Wolfpack and PARIKRAMA like this. Good to see that India has made it categorically clear, that their will be no Indian boots on the ground in Afghanistan. Blackjay, PARIKRAMA and Angel Eyes like this. I cannot even believe that you are saying this. You want to put lives of Indian soldiers on the line for white man's approval ? Blackjay, Agent_47 and Angel Eyes like this. Lose all goodwill earned in Afghanistan? India shouldn't send a classic "boots on ground" occupation force. 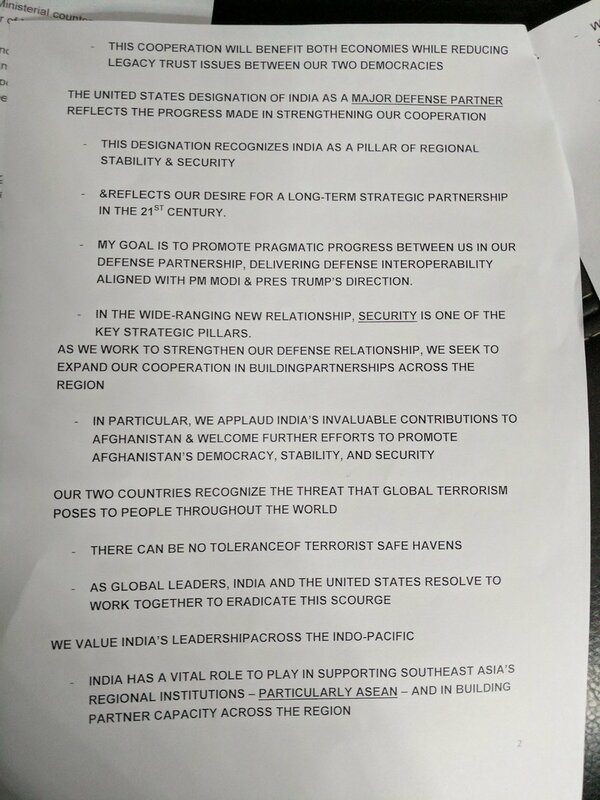 But I hope that behind the scenes, India sends SF operators and aerial assets to back the Afghan forces, basically replicating the very successful American template for fighting ISIS by backing local groups. This would be far more effective and less risky (in terms of image, potential lives lost etc) than boots on the ground, and the Afghans definitely need the help. Also, once you have a covert presence within Afghanistan with certain assets, that also gives you certain options against Pakistan from the West. 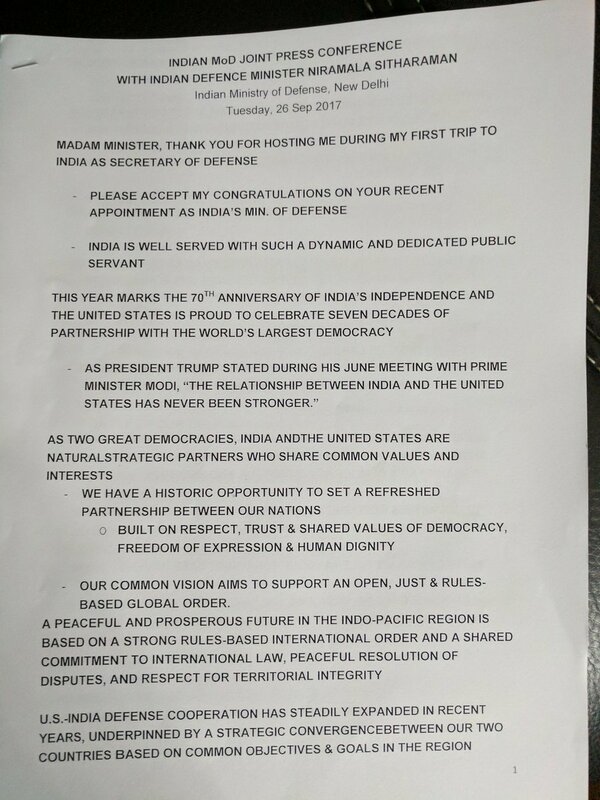 And in all honesty, you aren't going to get a bigger invitation than the subtle hints being sent India's way by the current administration. It's time for India to start asserting itself in Afghanistan, smartly and effectively. BlackOpsIndia, whitebeard, Wolfpack and 4 others like this.